Container for various SBuf class-wide statistics. The stats are not completely accurate; they're mostly meant to understand whether Squid is leaking resources and whether SBuf is paying off the expected gains. Definition at line 21 of file Stats.h. Definition at line 46 of file Stats.cc. References alloc, allocCopy, allocFromCString, append, assignFast, caseChange, chop, clear, compareFast, compareSlow, copyOut, cowFast, cowSlow, find, getChar, MemBlob::GetStats(), MemBlobStats::live, live, moves, nulTerminate, rawAccess, setChar, toStream, and trim. Referenced by SBufStatsAction::dump(), and testSBuf::testDumpStats(). Definition at line 17 of file Stats.cc. References alloc, allocCopy, allocFromCString, append, assignFast, caseChange, chop, clear, compareFast, compareSlow, copyOut, cowFast, cowSlow, find, getChar, live, moves, nulTerminate, rawAccess, setChar, toStream, and trim. Definition at line 30 of file Stats.h. Referenced by dump(), operator+=(), and SBuf::SBuf(). Definition at line 31 of file Stats.h. Definition at line 32 of file Stats.h. Definition at line 35 of file Stats.h. Referenced by dump(), SBuf::lowAppend(), operator+=(), and SBuf::vappendf(). Definition at line 33 of file Stats.h. Referenced by SBuf::assign(), dump(), and operator+=(). Definition at line 48 of file Stats.h. Referenced by dump(), operator+=(), SBuf::toLower(), and SBuf::toUpper(). Definition at line 45 of file Stats.h. Referenced by SBuf::chop(), dump(), and operator+=(). Definition at line 34 of file Stats.h. Referenced by SBuf::clear(), dump(), and operator+=(). Definition at line 41 of file Stats.h. Referenced by SBuf::compare(), dump(), operator+=(), SBuf::operator==(), and SBuf::startsWith(). Definition at line 40 of file Stats.h. Referenced by SBuf::compare(), dump(), operator+=(), and SBuf::operator==(). Definition at line 42 of file Stats.h. Referenced by SBuf::copy(), dump(), and operator+=(). Definition at line 49 of file Stats.h. Referenced by SBuf::cow(), dump(), and operator+=(). Definition at line 50 of file Stats.h. Referenced by dump(), operator+=(), and SBuf::reAlloc(). Definition at line 47 of file Stats.h. Referenced by dump(), SBuf::find(), SBuf::findFirstNotOf(), SBuf::findFirstOf(), SBuf::findLastNotOf(), SBuf::findLastOf(), operator+=(), and SBuf::rfind(). Definition at line 39 of file Stats.h. Referenced by dump(), and operator+=(). Definition at line 51 of file Stats.h. Referenced by dump(), operator+=(), SBuf::SBuf(), and SBuf::~SBuf(). Definition at line 36 of file Stats.h. Definition at line 44 of file Stats.h. Referenced by SBuf::c_str(), dump(), and operator+=(). Definition at line 43 of file Stats.h. Referenced by SBuf::c_str(), dump(), operator+=(), SBuf::rawContent(), and SBuf::rawSpace(). Definition at line 38 of file Stats.h. 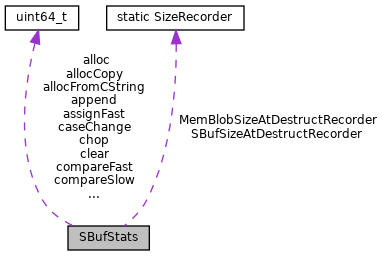 Referenced by SBuf::c_str(), dump(), operator+=(), and SBuf::setAt(). Definition at line 37 of file Stats.h. Referenced by dump(), operator+=(), and SBuf::print(). Definition at line 46 of file Stats.h. Referenced by dump(), operator+=(), and SBuf::trim().